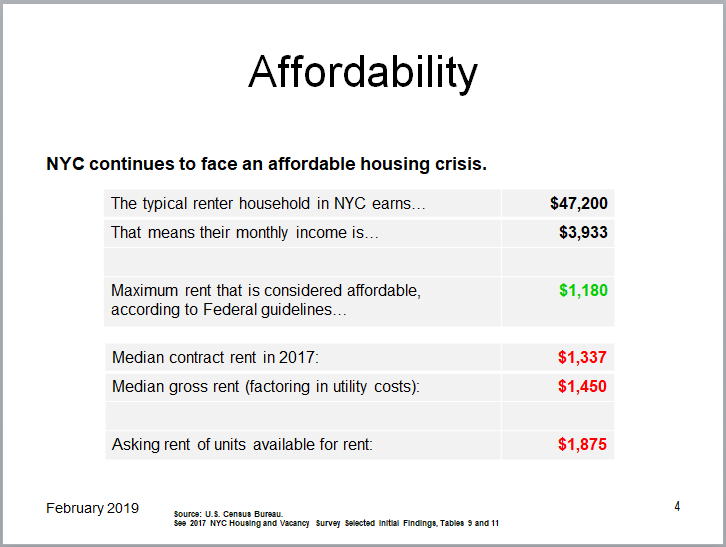 On March 8th UNHP held its Multifamily Assistance Center Annual Meeting at the offices of Enterprise Community Partners, with a focus on economic and real estate trends and the growing affordable housing crisis in NYC. The meeting was attended by 46 individuals representing 27 distinct lending institutions. These presentations are summarized below. To view the complete presentation materials, please click here. Jacob’s presentation focused on three important topics in the multifamily housing world - rent burden, building sales, and evictions. High rent burden has long been an issue in the Northwest Bronx. 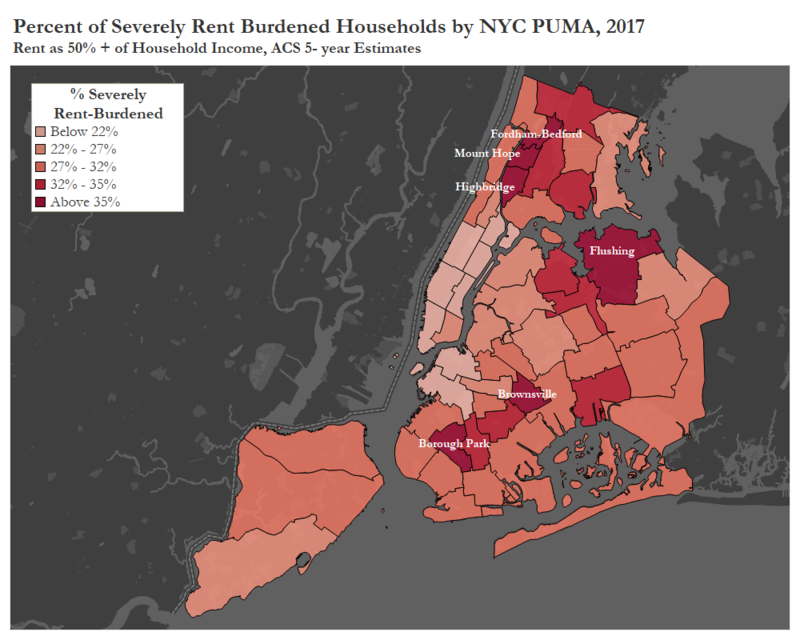 2017 data shows that the areas with the highest percentage of severely rent-burdened households – households paying more than 50% of their income towards rent - in NYC are located in the Bronx surrounding the Grand Concourse. It is important to note that these areas also have high rates of crowding, more than one person per room. Nearly the entire boro has 55% or more of total households experiencing moderate rent burden – households paying 30% of their income towards rent. More than a third of residents in the northwest Bronx neighborhoods pay more than 50% of their income towards rent. 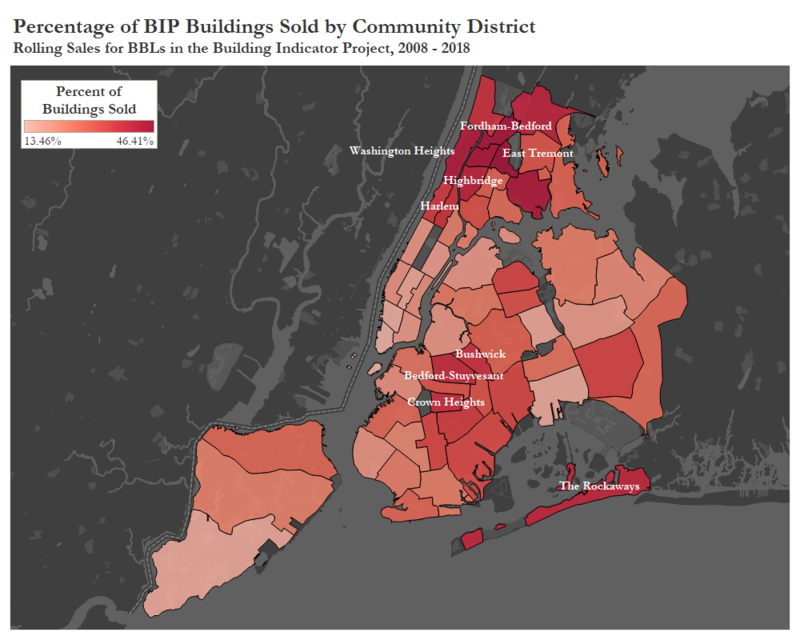 Rolling sales data shows a high percentage of building sales over the past 10 years in the same Bronx areas experiencing high rates of severe rent burden and crowding. 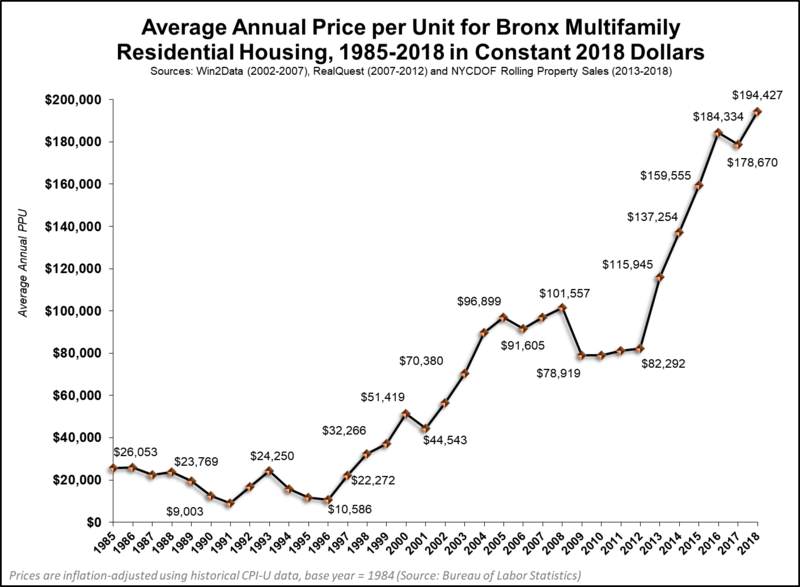 The average price per unit for Bronx multifamily housing has increased dramatically from 1996 to now; between 1996 and 2005 the average price per unit increased by approximately 800%. There are high levels of sales throughout the Bronx, Harlem, and Northern Manhattan. These areas contain a significant amount of the large, rent-stabilized multifamily buildings in NYC. Average Price per Unit in the Bronx increased from $82,292 in 2013 to $194,427 in 2018. Recently, a new evictions dataset has been made available by the Department of Investigations. The dataset contains information about all executed eviction warrants from the beginning of 2017 on. While it does not provide a complete picture of the evictions universe, it is interesting when paired with BIP and rolling sales data. The Bronx has the highest overall rate of evictions, with an especially high rate of evictions in buildings that were sold between 2008 and 2018. 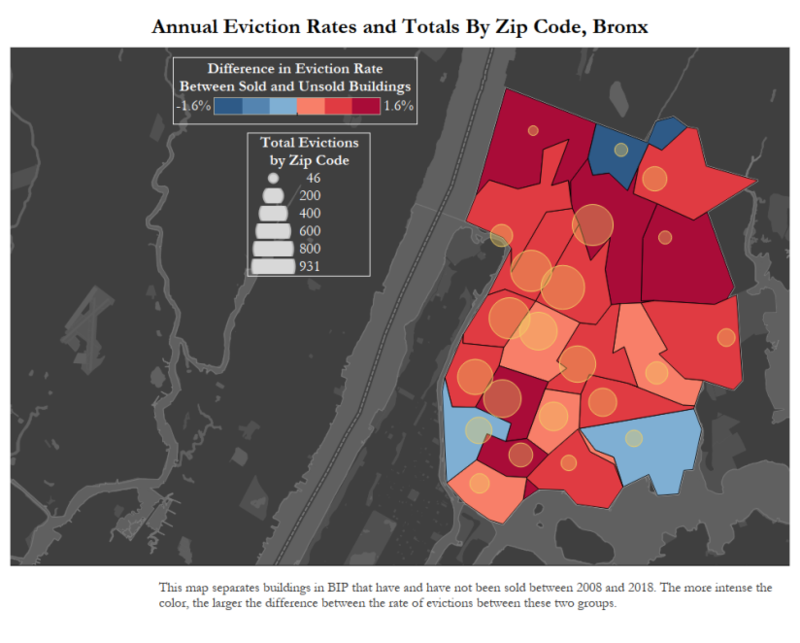 The Annual Eviction Rates and Totals by Zip Code map shows that the trend of higher eviction rates in buildings that were sold between 2008 and 2018 holds throughout the Bronx – even in zip codes with a relatively low number of evictions overall, there tend to be more evictions in buildings sold in the last 10 years. 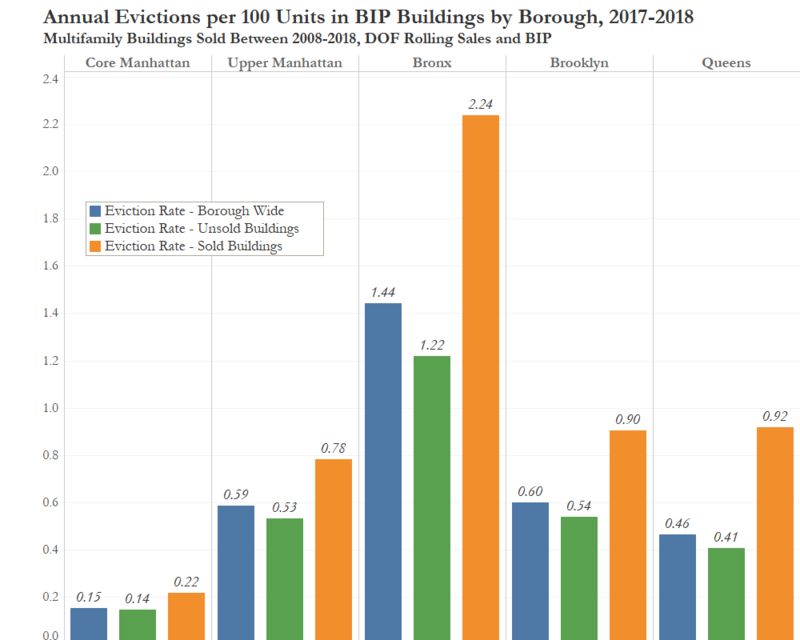 The Bronx has the highest rate of evictions overall, the rate of evictions in buildings sold between 2008 and 2018 is especially high. There are zip codes where there is a large difference in eviction rate in sold and unsold buildings (intensely red) and a small number of total evictions (small yellow circle). This shows that the increased rate of evictions in sold buildings is a boro wide trend. Kim focused on the current housing stock of NYC and the loss of affordable units throughout the city. 45% of renting households live in rent-stabilized housing while 42% live in private, unregulated housing. Between 2014 and 2017, the median rent in rent-stabilized buildings increased by 2.6%. Over the same time period, the median rent rose 9.3% in private, unregulated buildings. Affordability crisis in summary - rents continue to rise faster than incomes. Lowest earners are the hardest hit. Median Gross Rent increased 9.3% from 2014 to 2017 in Private, Non-Regulated buildings. It only increased 2.6% in Rent Stabilized buildings over the same time period. Overall, in 2017 more than half of renter households were rent burdened. One-third of renter households were severely rent burdened. While NYC is experiencing an affordability crisis, the city has been and continues to lose rent stabilized housing due to vacancy decontrol and luxury decontrol. This loss of units affects the lowest cost units – those with rents under $1,500 - in the housing market. There was a net loss of these units between 2014 and 2017. Housing New York 2.0, Mayor de Blasio’s plan to “finance the preservation and development of 300,000 affordable housing units by 2026” places increased emphasis on the needs of seniors, the lack of homeownership opportunities, the potential of underutilized land, and minimizing displacement through housing preservation. Kim discussed two HPD programs that aim to help create and preserve affordable housing. The first program is Neighborhood Pillars. This program helps non-profit organizations purchase unregulated buildings in order to maintain affordability and preserve housing. The second program is the Landlord Ambassador Program which aims to help landlords in smaller multifamily buildings access HPD financial assistance and technical support. Interestingly, Kim shared that through her team’s process of underwriting potential candidates for the Neighborhood Pillars program, she has seen first-hand just how aggressive some of the sales price assumptions are for low-income, rent-stabilized buildings being sold. In her experience, many of the asking prices she is seeing can only be justified by making every unit market-rate in just a few years. NYC rent regulation laws are set to be renewed on June 15th. This provides an opportunity for reform as “the current rent law structure, combined with inadequate enforcement, has helped drive the loss of over 150,000 rent-regulated units since the early 1990s”. Rent regulation changes are an important topic for those interested in multifamily finance because many of the existing loopholes are what allow landlords to quickly deregulate units, thereby increasing their rental income. Closing loopholes and expanding rent laws would dampen the “upside potential” of these buildings for investors looking to make a quick profit. Proposal - Eliminate vacancy decontrol. Proposals – Do not allow landlords to raise preferential rents at a higher rate than the Rent Guidelines Board sets, and preferential rents can only be raised to the legal rent after a vacancy. Proposals – Extend the amortization period, reduce the maximum annual rent increase, eliminate permanent rent hikes caused by MCIs and give landlords tax subsidies instead while rolling back any MCI increases from the last 7 years, and allow only temporary surcharges to rents for future MCIs. Individual Apartment Improvements (IAIs) – “If an owner makes improvements to an apartment while the apartment is vacant, the owner can collect a permanent rent increase of 1/40th (35 apartments or fewer) or 1/60th (more than 35 apartments) of the cost of the improvement. The IAI is added to the rent after the vacancy increases are applied.” IAIs can be completed in an occupied apartment with the written consent of the tenant. Proposals – Extend the amortization period of the cost, eliminate rent hikes, and make the rent increases temporary. Proposals – Eliminate the vacancy allowance, reduce the vacancy allowance, and determine the vacancy allowance based on the length of the previous tenancy. The three presentations were very informative and, unfortunately, demonstrate a steadily growing problem of affordability in the Bronx. Soaring prices, rising rent levels, and increased pressure on tenants make the need for some kind of action clear. Many of the potential New York State legislative changes on rents offer some much needed, immediate relief. UNHP will continue to try to inform the discussion and assist in developing strategies to preserve affordability in the Bronx. We would like to thank those who gave presentations as well as those who attended!